When you need some serious motivation in your teaching career, this seems to be the book to go to. Like most teachers, you probably felt a calling to be a teacher. Being a teacher is something that is innate and who you are. But like a lot of teachers, you may feel disillusioned by the bureaucracy that inevitably accompanies the teaching profession. This book delves into all of the aspects of being an educator and helps teachers reconnect with their calling and passion. I have only heard good things and the contents of this book and it is on the top of my list of books to read in 2016. If you feel like you don’t have the time to devote to a novel, you might like a book with quotes from educators, teachers, professors and politicians on the art of teaching and learning. Keep a book of important teaching quotes on your nightstand and read one quote before you fall asleep each night to remind yourself that teaching is a noble profession and YOU are part of it. Likewise, reading a quote about your teaching calling each morning as you get ready for the day can help motivate and inspire you to start your day on a positive note. Want to be inspired as a world language teacher? Revisit any book by Stephen Krashen. We all read his books as part of foreign language teaching methodology course at university, but that was before you had any experience teaching. Want to blow your mind? Read them again now that you’ve begun teaching. Total Physical Response Storytelling is a definitive way to add OOMPH to your teaching! If you’re not familiar with it yet, you’re missing out on an amazing way for your students to connect with the Target Language. Read up and brush up on TPRS and give the rest of your school year a boost! If you haven’t tried TPRS (Total Physical Response Storytelling) in your classes, what are you waiting for? 😉 Now might be the perfect time to register for a TPRS workshop in your area! A “quote a day” calendar for teachers is another nice option for daily motivation and inspiration! These are lovely to have on your desk at school (and also make great teacher gifts for your friends and colleagues!). They can be found with a variety of themes and can bring a smile at just the right moment- when you’re having a particularly tough teaching day. You’ve been hearing a lot lately about “growth mindset” vs. “fixed mindset” in the education and parenting community. By subtly changing the words you choose to praise your kids or students, you can help them develop a growth mindset. Read more about Growth Mindset vs Fixed Mindset here. Lisa Delpit has won several awards including the MacArthur “genius” award and Harvard School of Education’s Outstanding Contribution to Education. This book was nominated one of Teacher Magazine’s “Great Books.” And it is easy to understand why. This book helps the reader connect with the importance of understanding the cultures of the children we work with on a day to day basis. And it is vitally important as teachers that we take the time to understand. “Increase Student Engagement, Boost Your Creativity, and Transform Your Life as an Educator?” Umm, yes please! That sounds amazing! Sign me up! This looks like some pretty serious content delivered in a special way. The author, Dave Burgess, has also done a TEDx talk and I highly recommend it! Find the TEDx talk here. If you have seen the movie Stand and Deliver, this book about Jaime Escalante, the amazing Bolivian-American math teacher who was able to inspire real motivation in his students is bound to encourage you too. Check out some Jaime Escalante wisdom for teachers here on YouTube. Ron Clark has won some interesting titles in education including Disney’s Teacher of the Year Award in 2001. Maye it’s because he can entertain as well as educate. In this book, Mr. Clark breaks down essential teaching practices into 55 easily digestible chapters. He makes his ideas clear and easy to implement in your classroom. If you’re looking for some ideas that you can begin to implement in your classroom immediately, you might want to check it out. As a little BONUS and celebration of the January 2016 INSPIRE Sale happening from Jan. 20-21, I’m giving away my personal copy of Ron Clark’s “The Essential 55!” Please click here to visit the GIVEAWAY PAGE! 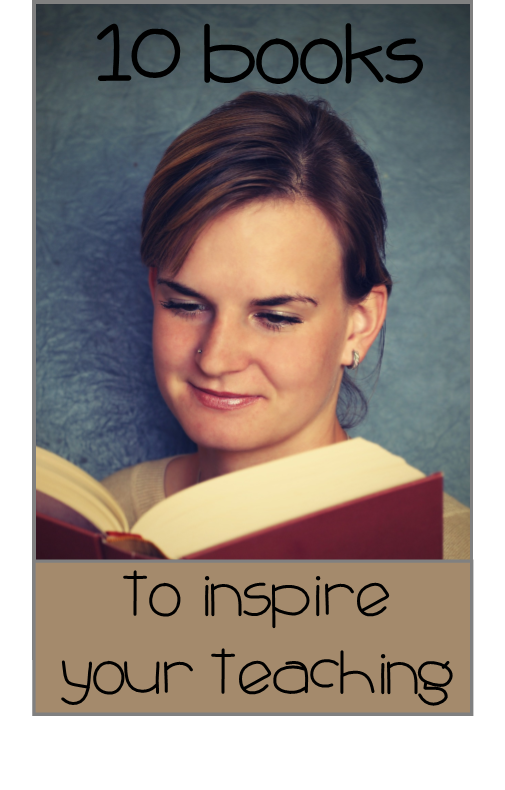 This is certainly not the definitive list of inspirational books for teachers! I would love to know which books you have read that have kept you going throughout the school year(s). Please comment below and share your ideas with us! I loved the Parker Palmer book – I’m glad it made your list! It’s a great book to go back to during difficult seasons of teaching. Spanish Class, Engaged Communication, Café y Conversación January 2016 INSPIRATION Teacher Giveaway!